Subdued – WordPress Theme for free! 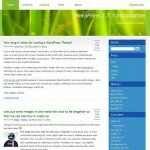 I just released a new free WordPress Theme at my other site Theme Corp. It is a two-column WordPress Theme with features like “Threaded Comments” [with WordPress 2.7 or higher], Custom Image Header, Tags Support, Sidebar Widgets Compatible etc.